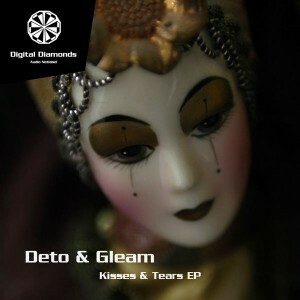 The Hungarian duo of Deto & Gleam (Peter Takacs & Mark Bokay) will steal your heart with the epic Kisses & Tears EP, the latest masterpiece from the Digital Diamonds advanced audio netlabel. The release opens with Kisses, a majestic slice of deep techno infused with poignant emotions and surprising intensity. With a runtime of nearly 24 minutes, Tears extends a warm glitchy groove into virtual infinity, consistently mutating and developing with sublime brilliance. The luscious embrace of these pulsating techno gems should leave every listener hypnotized. Cover photo by Kerstin Bauer. MP3 Download | FLAC Download | WAV Download · Download count: 13,046. Released under a Creative Commons licence for noncommercial usage. Visit the Digital Diamonds discography for more free techno and techtrance. Digital Diamonds also invites you to leave your feedback on this release. Wow! I just love such spacy music :D Thanks! This release is quite stunning. have listened to the tracks like 30 times!!!! great great job! This is fantastic! Nice sounds coming out of my speakers. Sorry too much Minimal Techno sounds for my taste. Is there going to be ever some release without this bleeping Minimal Techno? I’m rather dissapointed with this, and look for some real Techno classics instead. thanks for the comments and ratings! ^^What an utter shame!!! ~ This stuff is both very irritating and gives bad headaches…No joke! Music is a subjective experience, TechnoTrancer. I happen to think this is one of the finest releases I’ve posted in some time. I would appreciate if you revise your tone in future posting; constructive criticism is always welcome but insults and abuse are not. some classic acidmix inspired progressive techno vibes in this release that I’m exited to hear coming out. this sounds like live musical creation with a professional sound- nice. @ basilisk well hey its’ techno, if you get the typical “this is repetitive crap it has no melody to it” that’s kinda what you’d be expecting from trancers. Must say am impressed by the preview, so will download the wav of this straight away. Especially considering it’s only 2 tracks. Must say, the first track has a very satisfying second half too. This’d definitely go down well in a set or two. Glad I’m downloading this in well, lossless! Definitely do want to hear more. Wow. Very trippy and entrancing. I absloutely love it. Normally I’m a bigger fan of a heavier faster beat, but this sounds fantastic! Thanks for the post. I LOVE this website! isteni! csak így tovább srácok! Say no to reality !! Absolutely beautifully brilliant. . . love love love! fabulous – really well done. sensitive, soothing, sweet but serious at the same time. TechnoTrancer, if you are experienced headaches with bleeps and bloops, poke the stop button and its all over. This stuff is cool!!! TechnoTrancer is a dumbass!!! 8 years later, and these are still two of my absolute favorite musical compositions of all time.